Lawmakers want to hold smart robots responsible if they do humans wrong. If a robot, acting autonomously, injures or otherwise wrongs a human, who will be held responsible? Some European lawmakers think that the best way to resolve this question will be to give robots “electronic personalities,” a form of legal personhood. Proposed in a 2017 report from the European Union, this form of robot rights wouldn’t give them status like that of human beings — they’re not going to get married, or buy a house, or adopt a child. But it would make it possible for self-learning robots to sue and be sued, with legal status like a corporation. 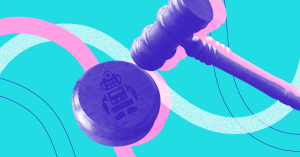 Proponents say that the idea is a common-sense move, one that will be necessary to create a workable legal structure as these entities become smarter and more integrated into everyday human life. But not everyone agrees. At least 156 artificial intelligence experts have warned the European Commission that this proposed move would be a poor one, both from a “legal and ethical perspective,” in a letter reported by Politico. As opponents see it, the move would simply shift responsibility for a robot’s mistake (say, if a caretaker robot used too much force on a patient and broke their arm) away from the manufacturer and to the robot itself. “This [European Parliament position] was what I’d call a slimy way of manufacturers getting out of their responsibility,” letter signatory Noel Sharkey, University of Sheffield emeritus professor of artificial intelligence and robotics, told Politico. But it does seem that the authors of the EU report considered this possibility. As The Verge reports, the report’s authors suggest that the EU establish a baseline for legislation that a person need only establish “a causal link between the harmful behavior of the robot and the damage suffered by the injured party” to be compensated by the manufacturing company. As our robots get more complex, so will the conversations about their rights. There are also other, mind-bending complications of robot rights if a machine’s actions and products belong to it, and not to its creator. For example, as one lawyer posited to the Guardian, if a robot with personhood were to create a device and patent it, who owns the patent — the robot or its creator? Who gets the profit from the sale of that item? And if the robot were sold to a different person, would that person gain control over that intellectual property as well? All this only pertains to robots that are reactive and proactive in their actions, but not truly self-aware. That’s because robots and artificial intelligence that think like a human brain and have true self-knowledge are a long, long way off. If or when we do manage to create robots that have a “Westworld” level of self-awareness, we’re going to need a completely different conversation about how to treat their rights. And it’s probably going to be a while before we get there.